" The answer to what causes scabies is a small mite (Sarcoptes scabiei) that you can only see under a magnifying glass or microscope. Scabies is a highly contagious skin condition, since the mites are attracted to human warmth and smell. It cannot live more than three days without a human host. However, it survives up to 30 days if living on a human. The mite lays eggs just under the skin which hatch and grow into adult mites. Symptoms could last for months or even years. Over the counter and preferable prescription treatments are available to both kill the mites and restore skin condition." The Doctors reviews a case of crusted scabies. The itch mite or scabies mite burrows under the skin to cause scabies. Scabies is a bug that strikes just about anywhere and at anytime. It all starts when mites of the species Sarcoptes scabiei tunnel into your skin, causing extreme itching. It makes no difference to scabies how old you are, your race, social class or gender. It doesn’t even matter how clean you are. Once a family member is infected with scabies, it tends to spread like wildfire. Sexual contact also will proliferate scabies. If you have never had scabies before, you may not show symptoms until four to six weeks later. The scabies mite cannot fly, or jump onto people. Note that mites that do not cause scabies can jump and fly. Scabies is known by three other names: Human itch mite, Scabies itch mite or the seven year itch mite. And unfortunately, it’s so small you can’t see it without magnification of some sort. It has eight legs and a round body that helps it to burrow into your skin, making a tunnel in which to lay its eggs. It’s the secretions these mites excrete that cause the relentless itching. Interestingly enough, the “average” person that is infested with scabies, usually has only five to 10 mites on their body at a time. If you don’t get treatment right away however, that number rises exponentially. Typically, scabies are found in areas where many people live under one roof. An example would be a nursing home or hospital, where people tend to have weakened immune systems. Those with sensitive immune systems may contract crusted scabies, also known as Norwegian scabies. This variation causes a scaly rash and thickening of the skin. The crusts also contain millions of mites and eggs. Generally speaking, the way you get scabies in the first place is when mites pass from one person to another by close contact such as hugging, sexual contact, sitting in the same chair as someone that has scabies, sleeping together, bedding, towels, furniture and wearing another’s clothing. School age children often touch during play, passing the problem from person to person. Dog scabies on humans causes a mild skin infestation. Canine scabies on humans cannot reproduce and die in several days. Symptoms include skin itch and irritation. Dogs and cats cannot spread human scabies. It is important to treat dog mange since the dog scabies on humans will continue to cause skin irritation on people until the dog is treated. Scabies typically present with a small zigzag blister or S-shaped track on your body – usually the moist parts, because scabies mites love the warmth and wetness for laying their eggs. The blister is the result of the female depositing her eggs under your skin. Young children can also see signs of scabies on the soles, palms, neck, face and head. Also look for a companion red rash.If it is the first time you have scabies, symptoms can take 2 to 6 weeks to appear. Even without symptoms, scabies can still be spread by a carrier. Individuals that had prior episodes will see scabies symptoms in 1 to 4 days. Itching usually occurs at night. Scabies can also cause a rash characterized by red papules or red raised areas on the skin. Note that it is important to avoid scratching as this could spread scabies from area to area. Scratching can also lead to infection. Since these little bugs can’t be seen, unless they are under a microscope or something else that will reveal their presence, your doctor will do a test by swabbing a suspicious area that is inflamed with sterile mineral oil. He will then take a skin scraping and look for the mites, eggs and feces. There is no blood test for this disease. If the first test is not conclusive, the physician will do an ink test, which involves a felt-tipped pen drawn on the suspicious inflamed areas. Once the skin is wiped clean, the mite’s burrows may be seen, allowing the doctor to diagnose scabies. The Scabies Mite is the answer to the question what causes scabies. 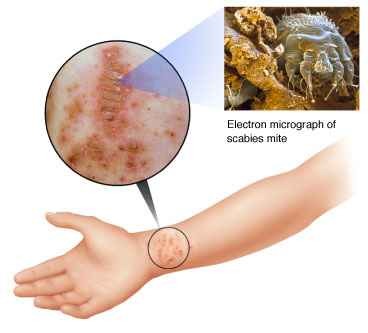 Scabies symptoms are shown here on the wrist. You will most likely need a prescription permethrin medication for what causes scabies, but over-the-counter remedies are available for you to try such as bush tea and tea tree oil. Let your doctor know if you also use an over-the-counter product such as AllStop so that you can be monitored in case you need to be switched to a prescription product later on.  Be aware that the itching and rash may last for up to two to four weeks, even after treatment. If that is the case, the treatment may need to be repeated. Wash everything like sheets, towels and clothing using the hottest water possible. Dry on high heat. For other items, bag them and store them for a week or longer. Clip your nails and clean them well. Vacuum your rugs, furniture, mattress and the interior of your vehicles. Throw the vacuum bag out. Don’t scratch, if you can help it. Try antihistamines, such as, Phenergan, Zrytec, Atarax or Benadryl. Use a disinfectant spray such as Benzarid to eliminate what causes scabies from the home. Use 5% permethrin cream, by prescription only. 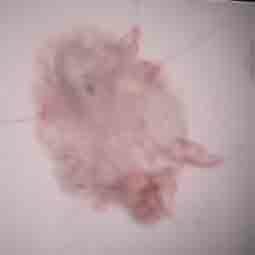 Smear from head to toe in spots like skin folds, between fingers and toes and in the groin just before going to bed. Leave on for up 10 to 14 hours and wash off. Prescription pill containing ivermectin. This is not FDA approved. The permethrin cream is viewed as being safer. For bacterial infected sores, antibiotics of choice prescribed by the doctor will be added to the treatment regimen.